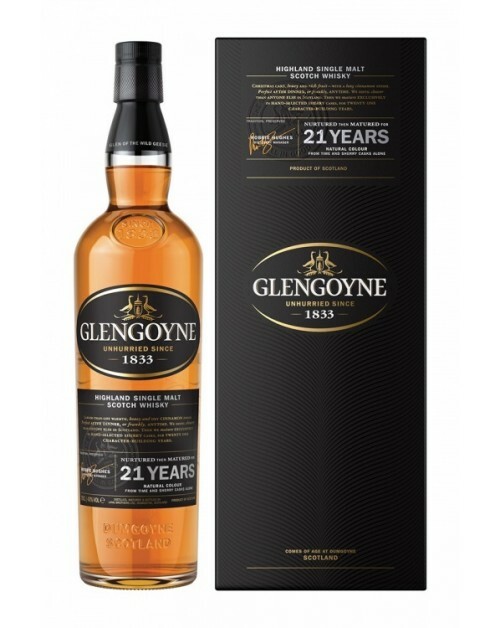 Glengoyne 21 Year Old Single Malt Whisky is perfect for after dinner, or any time you fancy! Distilled exceptionally slowly then matured exclusively in hand-selected oak Sherry casks for twenty one character-building years. Winner of a Gold Medal at the San Francisco World Spirits Competition 2005. Nose: Red apples, toffee, sherry and spicy strudel. Palate: Lots of Sherry, honey, oak with a building aromatic sensation. Ends with a delightful cinnamon nip. Finish: Long; sherry, spicy, warm and dry.